I can’t seem to gardenblog and attend to my actual chores at the same time, so posting has been sparse. Fall is always one of the busiest times in the garden and this autumn has been spectacularly wonderful for getting things done. Which is a good thing, because I am now very slow and have been very behind. Not that this is a new condition of life! The rhythms of seasonal change indoors means putting away summer clothing and bringing out the woolies. 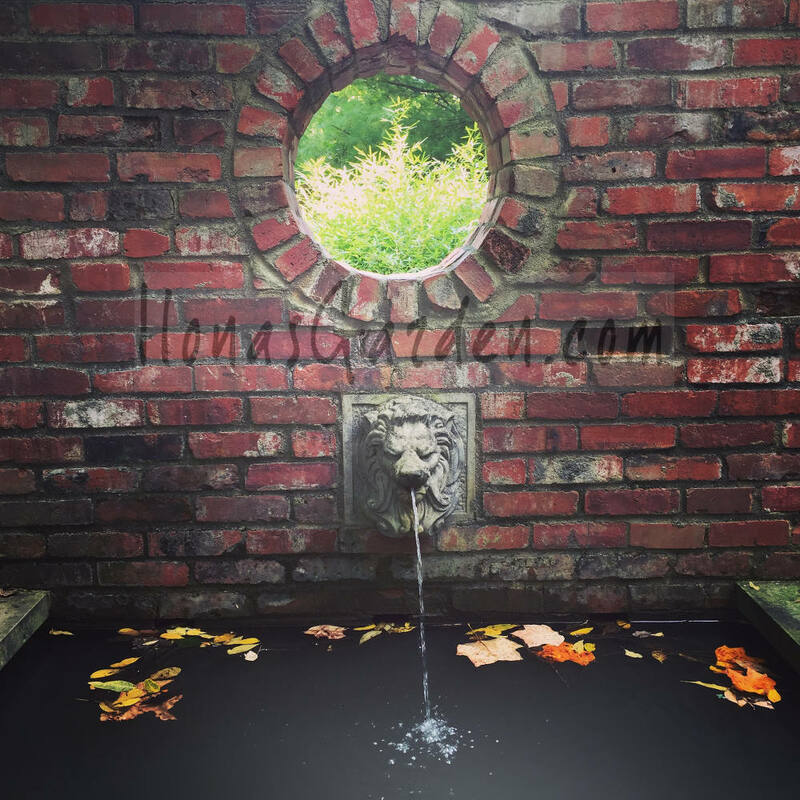 A similar set of tasks in the external areas of my home is an autumn ritual. Packed up al the outdoor cushions in plastic bags and stored in the shed. Ditto for most of the outdoor furniture and the grill. Cut down a lot of damaged tree branches. One of my cherries was 3/4 dead. After my husband cut away some large branches we saw that insects had eaten away the heartwood. Carpenter ants were noticed… was that the sole culprit? That tree had taken the brunt of the Japanese Beetle invasion, being defoliated every year since they arrived. It is also in the drift of farmers poisons. What contributed to its demise? As in all mature trees with problems, it seems there was a confluence of factors. I left the lone living branch, but there is little hope that I won’t be removing it completely in a year or two. But still… there’s a chance. We took out lots of nuisance mulberry trees and saplings, removed old lower branches from some of the oldest spruces. It is surprising how much cleaner the landscape looks when scrubby stuff is removed. There was a self seeded cotoneaster growing next to a sidewalk. I pried it out and planted it near the original, which has suffered loss the past few years. I hope it takes. Newly planted rose was blooming and looked beautiful in the focal point given it. It was bought at discount during this horribly hot summer. Planted where the old fir tree stump stood. It had looked, disconcertingly, like a groundhog popping up to stare at our garden. Now the graceful pink shrub rose delights me, instead. Peace in the garden. The new hydrangea has done well, looking forward to its settling in and coming into its own next season. This year I learned how to mow with a zero turn mower. When very young (pre-teen) I learned to use a reel mower; married with children found me using a push power mower…. through several upgrades to self-propelled; then learned to navigate the yard with a Woods West deck mower on the back of a tractor. When the Woods West gave up. in time we bought the zero turn. I was a bit scared of using it and didn’t have to since my husband had a short term interest in mowing (the new toy syndrome), and then my son took over. But young men get jobs and go to school and it becomes the woman at home who mows. Yes, I had a few times of “runaway mower”, but mastered it and can finally get the lawn mowed the way I like. ‘Zero turns’ are pricier, but much better than the small tractor mowers (which I’ve also used). Few people use the big tractor with a Woods West deck! Also managed a trek to Old Man’s Cave. With my less than athletic walking abilities, had to skip this annual trip the pst couple years, but I am trying to regain mobility. Pleasantly surprised to see how improved the Old Man’s Cave hike has been made for “challenged” hikers like myself. Very safe stairs, new tunnel, rather than precarious old trail, railings, all make this a hike I was able to master. 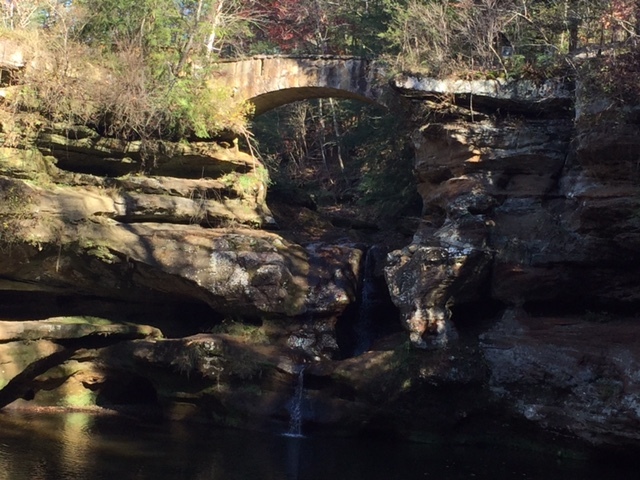 Not being a Granny Gatewood, it was my own little triumph to be back in the beautiful Hocking Hills on a perfect Ohio autumn day. And on the way home we bought real cider! So there it is, my autumn accomplishments. I hope your season was enjoyed… and now we can all look forward to the holidays! …and true confession: started putting up Christmas lights to beat the cold and damp. Two seasons ago I bought some gourds for autumn display, “just ’cause“, which lead to this years crop from the discards. I am already planning the Thanksgiving centerpiece with some of those harvested fruits of the compost pile, and it inspired this post. Gourds come in all sorts of sizes and shapes, and they were once used for practical purposes like bowls and ladles, birdhouses, and musical instruments. 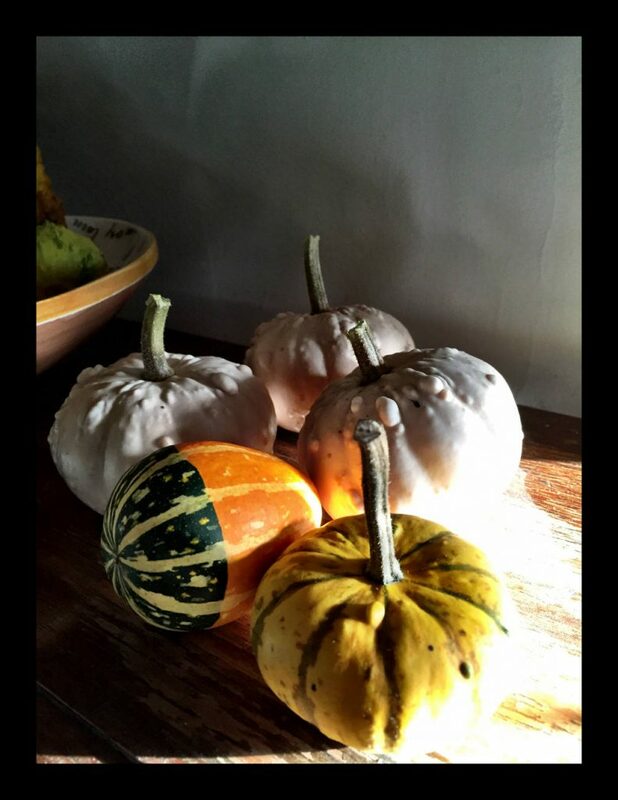 Most of us just display gourds indoors during the fall season. Some gathered ideas on how to use them in displays will inspire you make plans on growing your own next year, I’m sure. They’re very easy! 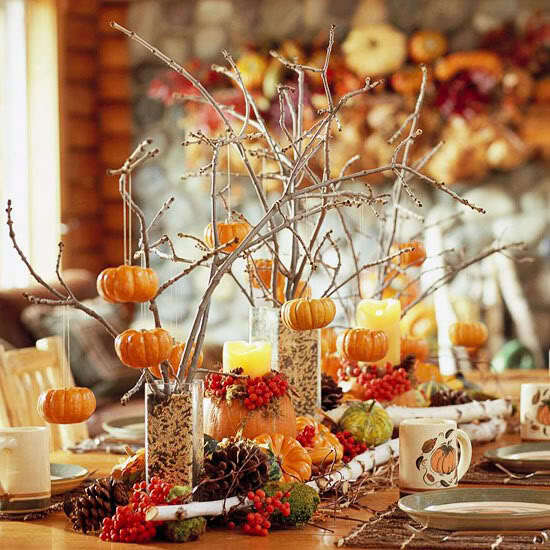 With a simple wooden box and white candles, just a few gourds, some foliage and pine cones turn into something special. 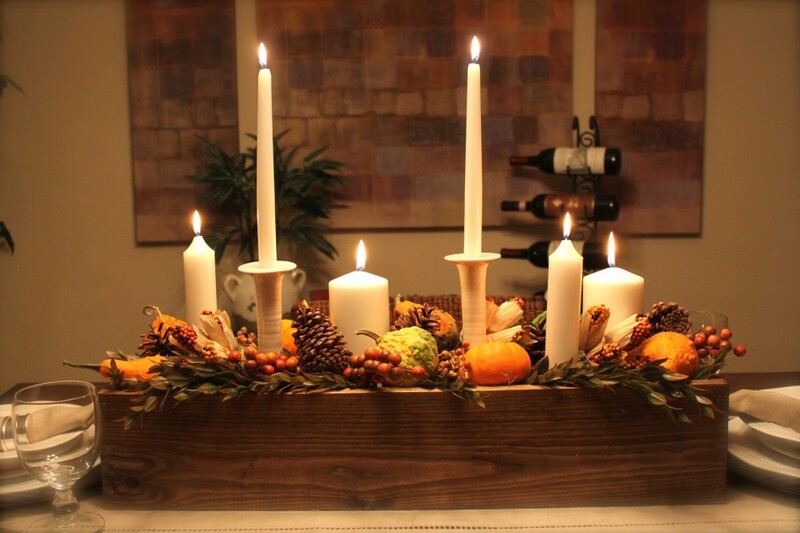 I would create a barrier between the candles and the dried materials if planning on lighting the candles, however. Like the mason jars used in the next picture. 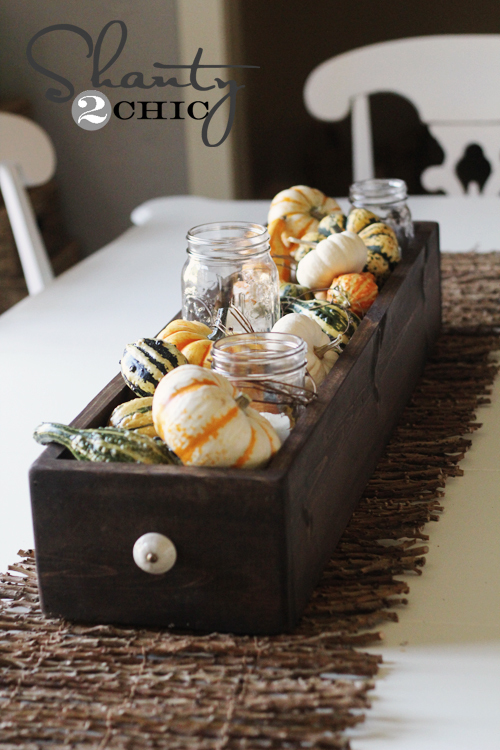 A similar idea, but with just the gourds and mason jars holding the candles. The post at Shanty 2 Chic not only presents the idea but has a complete illustrated demonstration of making the wooden box! 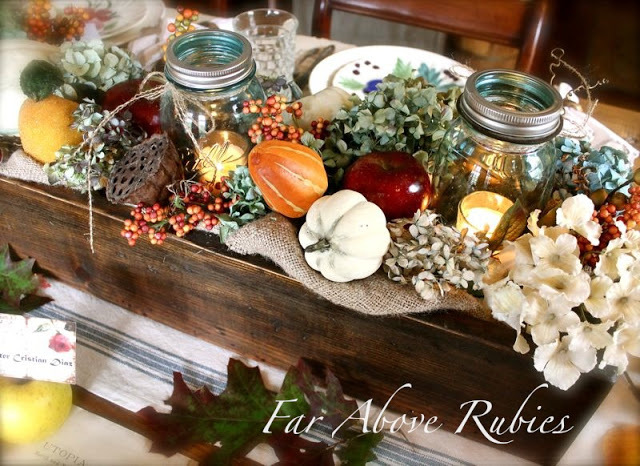 A few different elements: dried flowers, bittersweet, and fresh red apples are just one idea form many centerpiece ideas on this post. One time saving idea given: switch out a few elements to take into the next season. Try inserting pine cones and evergreens for gourds and bittersweet. Strung from branches, tiny gourds make a statement. Just as effective when they are placed directly on the table, piled up in compote dishes or arranged on a table runner, an array of gourds bring a harvest touch to your home. 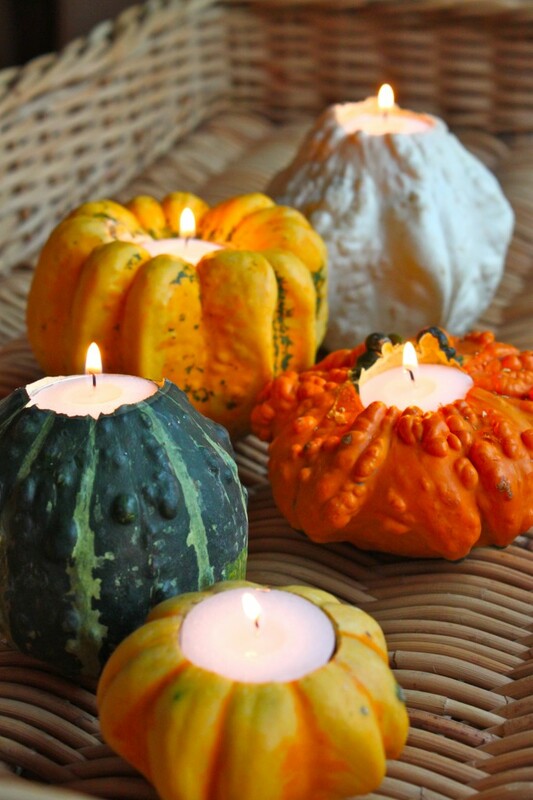 hollow out a votive sized holder from your fresh gourds. Jennaburger.com came up with this darling idea after buying some oversize lanterns. She repainted them in colors she preferred and filled them with little gourds. If using real gourds, remember that real cold (frozen for a length of time) will turn vegetable material to mush, but Autumn temperatures shouldn’t be a problem. simple, but visually effective, using things I already have. Using two matching containers (or you could go with one very large one), Jo-ann filled it with medium large pumpkins, gourds, and spikes of willow. You could use any decorative twigs. I grow Harry Lauder contorted hazels just for that reason. 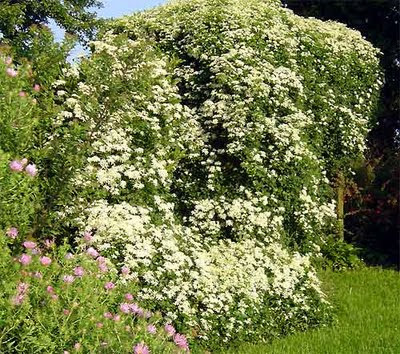 Spirea shrubs have nice twiggy branches, but any 3 ft. vertical length of twig will do, and voila! 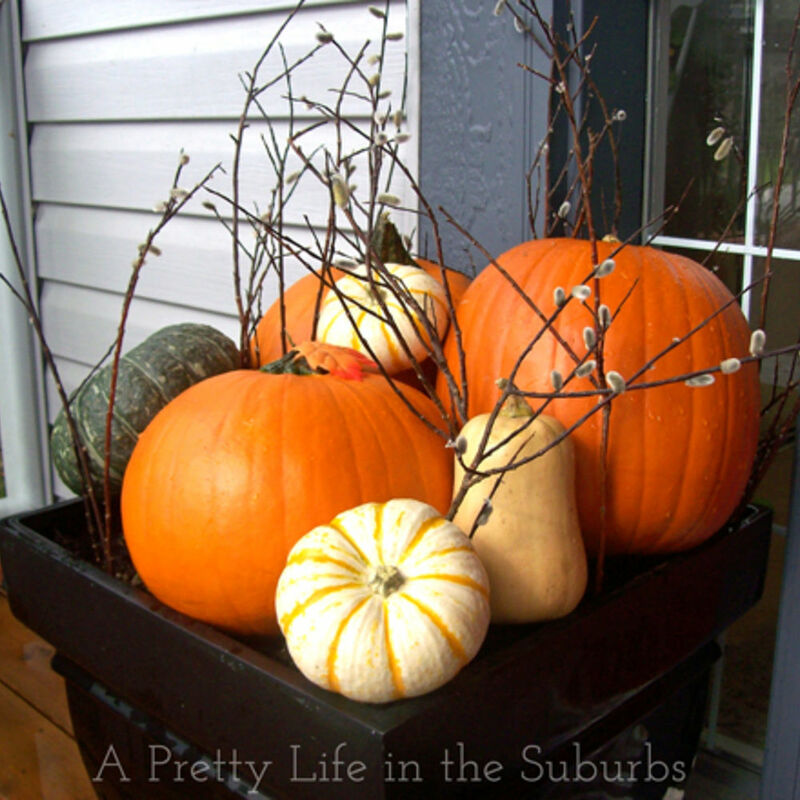 a beautiful fall porch decoration. 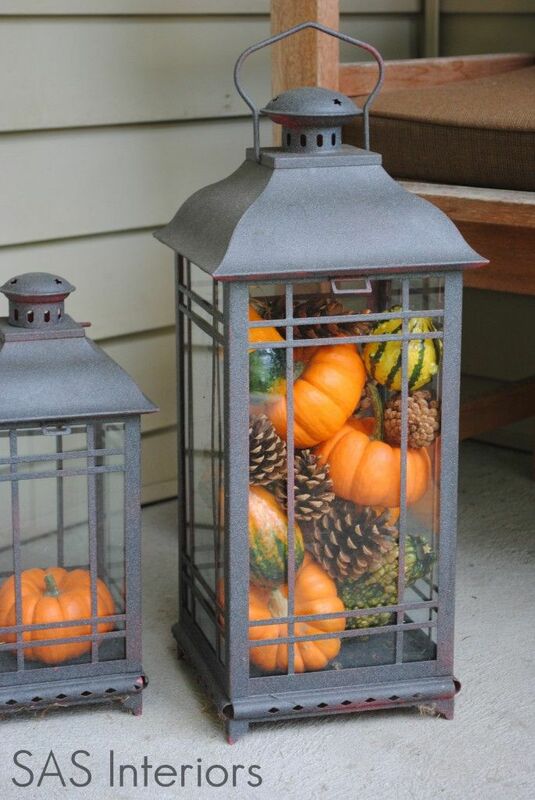 Tip: to fill containers, you don’t need lots of pumpkins or gourds, use chicken wire underneath and set decorations on top. Wire will also hold twigs in place. Now that you have this sampling of ideas and inspirations, go create something with your gourds. Because we can all use touches of beauty and celebration in our lives. The door is closing on this growing season. To make up for the sense of loss, somehow the season has incredible sweetness. Frost has that effect on things. On fruits, on the the ground, on our souls. 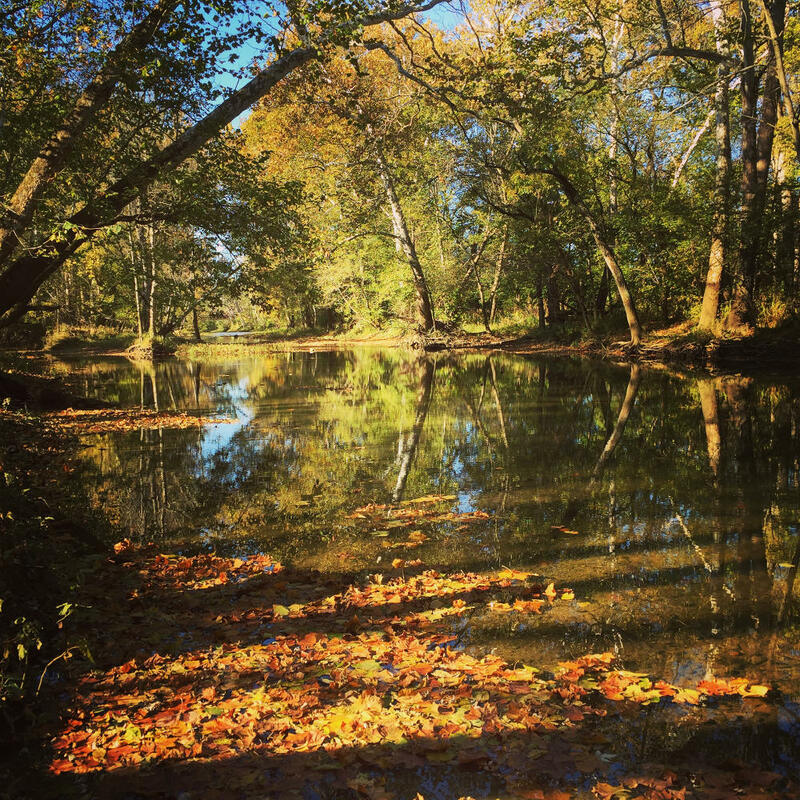 It is as if to placate our mournful sense that the pleasant days of fall will give way to winter’s austere lessons of rest, endings, and survival. I have had a few simply perfect days of warm weather, crisp mornings which end in mellow afternoons. The days are shorter, but filled with end of season work. The kind of work that is a pleasure to accomplish. Gathering in the last of tomatoes, picking gourds for indoor decor, clearing out the old garden to make way (and planning already!) for the new. It is time to put away outdoor furniture and cushions. Clean up the vegetable garden. I have readied the outdoor furniture’s cushions for storage, but the nights are just right, still, for gatherings around the fire. I have to put away the lounging invitations of our back porch, but not yet ready to relegate all seating to the indoor fortress of a cold climate. That will come soon enough. 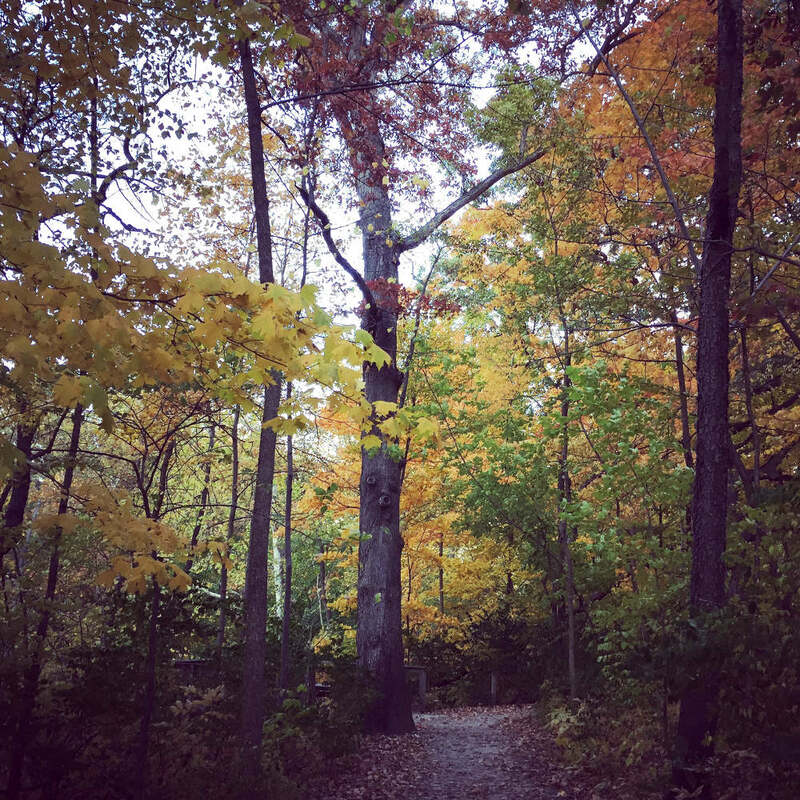 There is something so sweet about the smells of the dying and fallen leaves. If you pay attention, the individual trees and plants have their own distinctive fragrance to them. Maple is most acrid and strawberry is aromatic, not with strawberry smell, but in a likeness. Walks and short hikes have been in order. Enveloped in the woodsy aroma of thickets, trees and streams dotted with floating leaves, filling my memories with the gaudy color framed in browns and stubborn greens. It is apple time, and the farmer’s market is bursting with varieties of all kinds. Pumpkin pies are on my menu, and the aromas of burning leaves and hickory logs in the chill nights all infuse life with sweet smells and a cozy sentimentality. It warms my inner thoughts as well as my jacket clad body. This time of year increases our craving for comfort foods, many made from the increase from our gardens. Along with apple everything, good cabbage dishes and tender squash, chicken pot pies and hearty soups suddenly sound irresistible. We have had a few frosts. None have been the hard killing kind, so there are still some flowers in my wildflower patch. Soon though, this soft kindly end of my garden will be over and the realities of winter in the North will arrive. I know that. I just want to dream and revel in this aromatic and sunshine warmed time a little longer. It has been a very lovely year in Ohio. I wish I could say the same for other parts of the country, places with persistent drought or with record rain and flooding. My heart always goes out to those who struggle surviving the elements. We are all vulnerable and subject to these whims of nature. All the more reason to count our blessings and fully appreciate the good that is given us, today. I am grateful for the good harvest, the comfortable weather, and the generally congenial conditions of this past season. It is to be savored in our memories, as not all years are so gentle and generous. We are so eager for spring color that it is a cinch that our spring gardens have at least ten gorgeous garden delights to look forward to, but what about autumn? Autumn in my area is one of the loveliest times of year, with moderate temperatures, clear sunny skies, and a crisp scent in the air. It has its own beauty and if we feature some key plantings we can celebrate the fall season in our own gardens, the way we do in other parts of the year. Viburnums: berries and dusky fall color from many of the Viburnum family maintains their valuable impact on the garden landscape. Leadwort, Ceratostigma plumbaginoides syn. 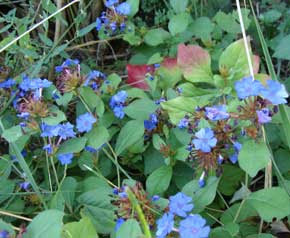 Plumbago larpentiae: A very pretty little groundcover that shines with blue to bluegreen flowers. An arresting color contrast to all the oranges and yellows of fall. It also has its own burnished red fall leaf color to add. Chrysanthemums: cushion mums are my favorite. There is no other flower in the garden that is as showy as these mounds covered in colorful long lasting colors of bronze, gold, yellow, mauve, pink, dusty red-pink, and white. Whew! Did I name them all? What about the varied flower forms? Asters, Michaelmas Daisies: My asters get huge and bend over with purple and pink clouds of flowers; they also reseed everywhere. There are many types of asters, some which do too well, and others far more well behaved, such as the famed ‘Frikartii Monch‘ or ‘Wonder of Staffa‘ which never could take hold for me. They are beautiful if you have their preferred conditions. Humus rich soils and reliable moisture for them, while the New England asters are not nearly so picky. Rose hips: Rosa Rugosa and Rosa Glauca both have outstanding rosehips that are persistent throughout the fall, sometimes into winter. 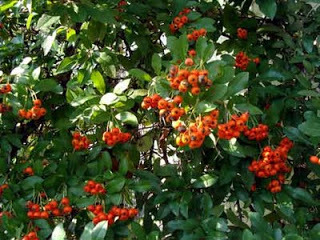 Pyracantha: beautiful bright orange or clear gold berries that are persistent well into winter. Dark green shiny leaves set off the berries despite frosts of autumn. I can tell that the author of the OSU plant profile does not care for this plant, but I appreciate both its flowers, fruits, and shiny green foliage. The thorns not so much, but I use it as a protective plant for this reason. sometimes you need a plant with good thorns. Japanese Anemone, aka “Windflower” is a delicate looking flower blooming in pinks and white, mostly single, like ‘September Charm‘; some doubled like A. x hybrida ‘Margarete’. A. x hybrida ‘Honorine Jobert’ is an exceptionally nice choice. Sedum ‘Autumn Joy’, or try Sedum ‘Brilliant’, ‘Matrona’, or ‘Sunset Cloud’. They all provide a strong presence in the garden with medium sized plants, and plates of colorful, yet harmoniously subdued flowers. The flower heads persist through out winter if you don’t remove them and create winter pictures when they catch the snow. The leaves often turn a clear yellow after frosts. My very favorite is S. ‘Mediovariegatum’ with variegated leaves and pale flesh-pink flowers. Hostas: one thing little said about hostas is their good fall coloring. A large group of them can provide tints of yellow brushed with rusty red. Sweet Autumn Clematis: although the flowering not long, it is exuberant and fills the air with a sweet soapy fragrance. This clematis is also a butterfly magnet. After the flowers are over, the fluffy seedheads provide some interest; but it is that wild burst of bloom that makes it a feature for fall. These plants sometimes begin their bloomtime as early as July. One of the tricks and tips in flowers that you want to hold off blooming, like asters or chrysanthemums is to tip them back in early summer, but no later than July 4th. This pinching technique is especially helpful to keep New England asters from getting so leggy that they fall over (which they may lean a bit anyway. I use pruners for the asters and simply pinch the terminal buds of cushion mums with my finger. Mums are heavy feeders, so they always benefit from good soil and fertilizer. Pyracanthas are often trained as espaliers, so that indicates how you can prune them to the shape you need. Just remember that pruning will remove flower and berry for that year. Birds like to eat them in late winter when there isn’t much else around. Leadwort is used as a groundcover, so it might be a bit too rambunctious for you- I have never found it anything but polite in my garden. The same is true of the Japanese anemones, for me. They are beautiful additions to your garden- I only wish I had more. They will grow well in part shade. Sedums are so versatile. My variegated variety is a garden stalwart giving long season beauty with little care and making a good show wherever I place it. It was a passalong plant from a friend. I hope you find these suggestions helpful in brightening up the autumn garden at your house. Fall is one of the best times to garden, and August September is ideal for putting in new perennials and shrubs. (Water them if it gets dry, until the fall rains come). 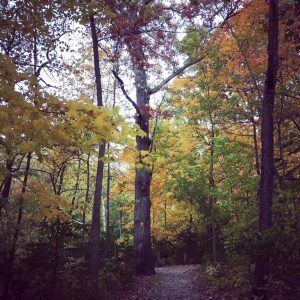 Past Thoughts on Fall Color. Autumn provides an abundance of certain foods … and besides, the change of season just makes us hungry for those apple desserts and tomato-laced stews. The sweet peppers are becoming red and we all have our favorite culinary uses for those. I thought I’d share some of mine. My favorite apple cakes are the Hungarian style, which either means the not-too-sweet European type of cake or the streusel-topped quick one pan types. (1) Stir 2 tsp butter and brown sugar,cinnamon and walnuts til crumbly. (2) Beat butter and white sugar til creamy.Add egg yolks. Add flour, salt, and baking powder, alternating with sour cream. Sprinkle with the walnut mixture, then apples. Excellent company cake, can be served with whipped cream or ice cream, or plain. You need eggplant, zucchini, ripe red tomatoes, sweet peppers ( any color), onions, and garlic, as well as some Provençal herbs, like thyme, rosemary, and bayleaf. Chop up vegetables into medium chunks, saute onion in some olive oil, then add in the other vegetables, cook with additional olive oil ( the flavored types are wonderful- rosemary or garlic flavored are my favorites for this). Add in herbs, salt and pepper, and cook until soft, but not mushy. Quick, healthy, delicious. There are many recipes for this on the web with more careful prep. directions, but this is how I make it. Very good on the side of any meat, but fine on its own, it is a Mediterranean flavored dish and goes well with couscous or pasta and fresh salad of any type. Lots of Sweet red peppers? Slice them up, sprinkle with olive oil, roast on low heat for a little while, and you have roasted red peppers to dress up your veggies, to flavor your grilled chicken, to add to your spagetti. A few other things on the plate and you have anti-pasto for any pasta-based meal. My autumn is misty and grayed in the mornings, and as I sip my coffee I view the diagonal sifting of the leaves from the overhead trees. It seems as lazy as I feel on these mornings, languid and savoring the details of my existence. The mornings have been filled with mists desaturating the colors of the Autumn blaze, but by the very contrast the upclose colors fairly vibrate. Two of the brightest plantings at this time have been the purpleleaf sand cherry which is almost a ruby-fuschia, situated near to the Hansa rose which is a clear golden yellow. Their competition in color is the sweet gum showcased against deep dark Norway spruce. The golden glowing hostas are now crimped in brown edges from the ever harsher frosts, although the warmth of this day is the fleeting Indian Summer giving its last kiss to remember for the year. The mists will soon become blusters and the gray of this morning will soon be Novembers blanket throughout the day. Putting my gardening year to bed, that I might dream through the midwinter’s freezing sleep. I know I must work while I may…. although the garden will accept the trowel long into December, I am not at all sure I want to defiantly garden during that chill this year. Although November may well see me hurriedly bury the bargain priced bulbs, like a squirrel caught unprepared. The gardener squirreling away the dreams for spring! Fall is given to savoring and soaking up the tastes of harvest, the comfort of warm stews, the sweetness of apples, the fires against the cooling of the season, the woodsmoke and the fragrant decay of the leaves. When the skies are blue they are piercingly so, when the sun is shining every color vibrates in competition. Knowing that it is so brief calls me to enjoy….. sit and enjoy, even if it is only a few moments. A few moments before I remember that I have the yard furniture to still put away, the leaves to rake before the wind blasts them all about the yard, the last of the year chores to ready the yard for holidays and snows and cold. The delight of the diversion is nice while it lasts. So very nice.